The Briard is a herding breed that most often works with sheep, but can also be used with cattle. Unlike most herding dogs, the Briard is capable of protecting their flock from predators such as bear and wolves. They specialized in guiding large flocks to different pastures and kept sheep moving as it grazed amongst rows of crops. In secondary roles, the Briard has traditionally served as a military and police dog. Its French name, Berger de Brie, translates to ‘sheepdog from Brie’. It was once known by the alternate names of Chien d’Aubry or Chien d’Montargis. Some breed historians believe that ‘Brie’ may have resulted from a corruption or mistranslation of ‘Aubry’. The Briard, along with its close cousin, the Beauceron, have been known in France since the Middle Ages. Although their French names indicate they are from distinct regions, both dogs could be found throughout northern France. It is quite possible the Briard pre-dates the Beauceron, as tapestries from the 8th century depict dogs very close to the modern breed at the feet of Emperor Charlemagne. However, it did not receive its current name until 1809. This was in an account written by priest Abbe Rozier, who first distinguished the Berger de Beauce as having a short coat and the Berger de Brie as having a longer coat. The two would not be formally separated until 1896 and interbreeding continued into the 1900s. After the split, it is theorized that some Barbet blood was added to the show lines, which decreased the size of the Briard in comparison to the Beauceron. Throughout the centuries the Briard has had many famous fanciers. It is said that Napoleon Bonaparte took his Briards to the island of St. Helene when he was exiled. Both Thomas Jefferson and the Marquis de La Fayette brought Briards to the United States in colonial times, although it would not become established there until the 1900s. During the World Wars, the Briard was utilized by the French military for a wide range of tasks. This included carrying messages, food, and ammunition to the front lines, as well as searching for wounded. This service brought them to the brink of extinction due to the number of dogs that perished during the fighting. However, it also helped increase the breed's popularity as it became known around the world. The Briard was recognized by the American Kennel Club in 1928, where the Beauceron would not do so until 2007. 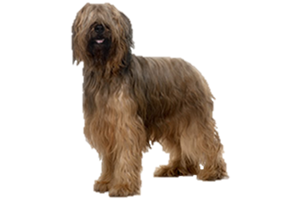 Today the Briard remains extremely popular throughout Europe. In France, it is second only to the German Shepherd Dog. It is still used to herd both sheep and cattle, for protection, search and rescue, as well as police and military work. Is the Briard Right for You?